The Beijing Tai Chi & Kung Fu Academy was founded in 1999 by Sifu Jonathan Weizhang Wang. With 18 years of Kung Fu training, Sifu Wang decided to pass on to others the knowledge and skills that he had acquired under both Grandmaster Jiang Hao Quan and his father, Grandmaster Daniel Yu Wang. The goal of the Beijing Tai Chi & Kung Fu Academy is to revive the Nan King Guo Shu Institute’s curriculum and train the most well-rounded Kung Fu artists possible. Kung Fu is a 2000 year old traditional Chinese martial art with approximately 129 different styles. In order to preserve the art of Kung Fu, the Chinese government created the Nan King Guo Shu Institute in 1927. Top Masters in China gathered together to train hundreds of students. These students were required to fully master forms, weapons, fighting sets, freestyle weapons and empty hand sparring before being allowed to graduate. • Good physical fitness exercise for strength, speed, agility, and flexibility. • Good for building up power, explosiveness and stamina. Also good for general health of internal organs. • Good for stress management and breathing. Supports the health of internal organs. • Good physical fitness exercise for speed, agility, flexibility, and coordination. • Good for competitions and performance. A balanced teaching system results in a balanced Kung Fu student. The BTKA approach, based on the historical Nan King Guo Shu Institute teachings, is to train students in a variety of styles and disciplines. 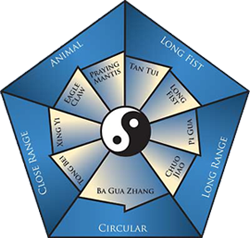 While other schools might focus on one style of Kung Fu, BTKA teaches all of the components necessary: Long Fist, Long Range techniques, Close Range techniques, Circular technique and Animal emulation. This method produces a well-rounded, effective and balanced martial artist that is prepeared for any contingency.